My goodness, the weather has been completely against me ever getting photos of this new wardrobe addition. 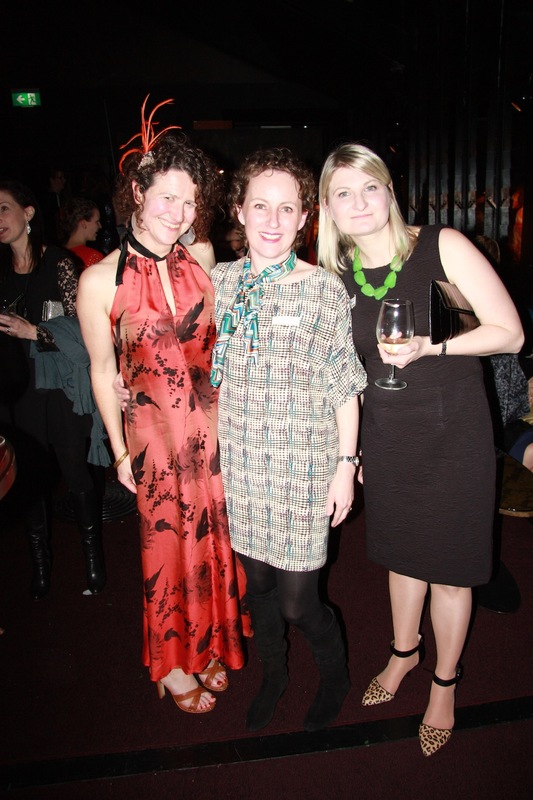 But with Frocktails on Saturday – I really had no excuse. I was going to wear this dastardly silk top out for the first time, dammit! I’m not usually one for floaty, formless garments, but this Rachel Comey one has been on the radar for a loooong time. There are just too many amazing versions out there on the interwebs not to be sucked in. What better time to try a completely new-to-me garment style than the here and now? Actually, I lie. I decided to try my hand at a shapeless, flowy garment because I’m currently halfway through being pregnant, and it seemed like an appropriate time to try a new form… Obviously when I made it there wasn’t anything sticking out, but I had rather intended to be able to wear it once the warmer weather decided to show up! Pretty unimpressive for a 20 week bump, really. My jeans are held together with a hair tie but. I bought this pattern a loooong time ago… well before I realised from PR reviews that you really do need to size down at least 2 sizes. I understand that it’s supposed to be a baggy top, but really? There is good baggy and then there is bag baggy. I am usually a Vogue 14-ish, so ideally needed the 10. I had to cut the 12 though due to the size range on the pattern I had. After I made a muslin – in which I made a fair few changes – giving shape to the straight centre back seam, taking in the side seams to mirror the waist curve I had at the time, and lengthened the hem slightly – I was really quite pleased with the result. I was definitely tempted to overhaul it to make it more form fitting, but I managed to resist. I’m not sure if it’s because of the interesting seaming, or because it still looks like it holds some shape, but I have a real affinity for this top – even though I’m moderately ambivalent about how it looks on me. I do love that it’s the perfect opportunity to bust out the lightweight silks, which I am so easily tempted into buying but never really have a ‘practical’ outlet for. I deliberated for a loooong time over whether or not to use the fabric that you see here. I had originally bought it with a dress in mind (I even have a matching chiffon) and breaking from that mindset was hard. Definitely the right decision though, as this top will get infinitely more worn and appreciated than had I sewed a dress for a formal occasion. It’s a silk charmeuse with the kind of soft, painterly pattern that I never fail to fall hard for. Whilst I sewed the muslin in the ‘normal’ way (1.5cm seam allowances) – I just don’t think you can get the best result when sewing with silk in this fashion. Especially on those bias seams. Especially not on my base level Janome, which loves nothing more than making a dog’s breakfast out of lightweight silks. So for the real thing I did ‘my normal’ of what I guess is often called couture methods – seam lines marked and no specific seam allowance. It’s also underlined in white silk crepe de chine, which carried the seam line and pattern markings, but which also has the dual function of ensuring this top is utterly opaque. You’d never know if I was wearing a fluoro bra underneath this puppy. And as I love brightly coloured underthings, this works well for me. The crepe de chine underlining does probably make it slightly less flowy that many other makes I see on PR and Burdastyle (especially the chiffon ones! ), but I don’t mind it as it is. If anything, I feel a bit more ‘secure’ in it! Otherwise, I mostly followed the instructions for this pattern – they’re really quite adequate. 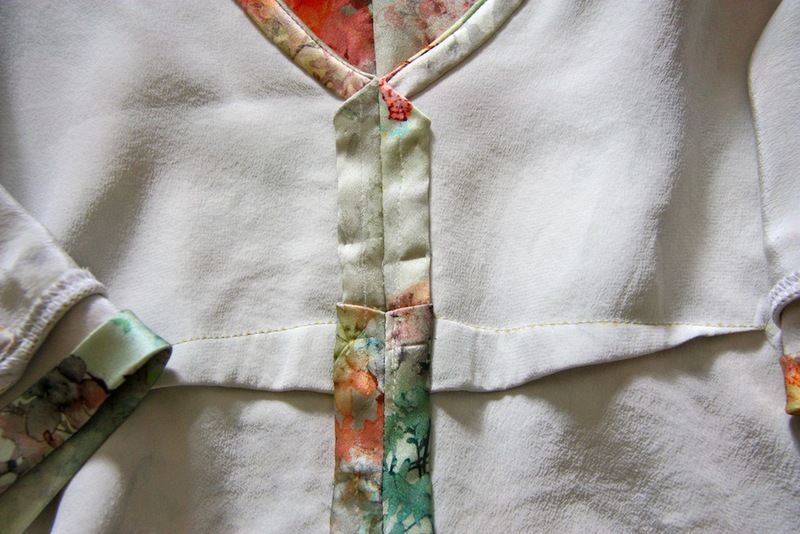 Except I handstitched the neckline facing down to the crepe de chine underneath (another genius reason for underlining – avoiding topstitching on tricky fabrics!). 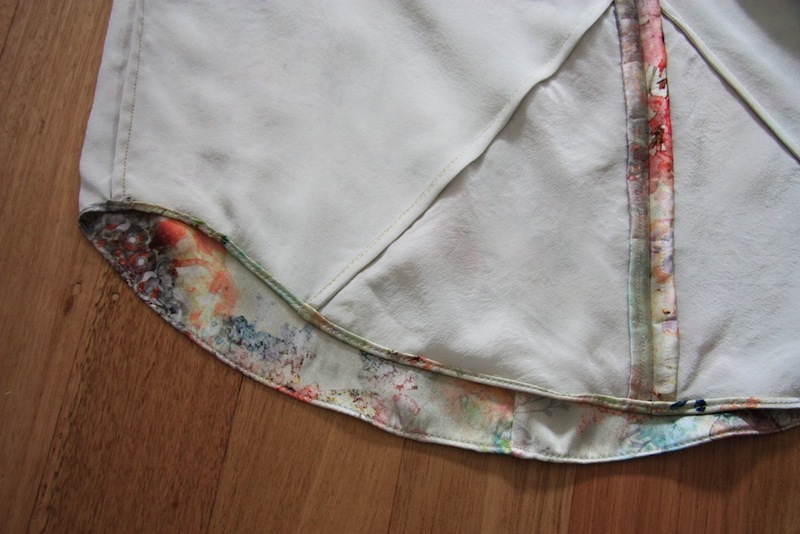 Usually I sew in spurts and chunks – 15min and a seam here and there. But locked away at a ‘quilting retreat‘ with no life interruptions for four days straight tested my fancy seam-finished resolve. With access to overlocker, I caved. In other sewing news, I finished my second French Jacket (for mum) in late July which has been sent off to Queensland. 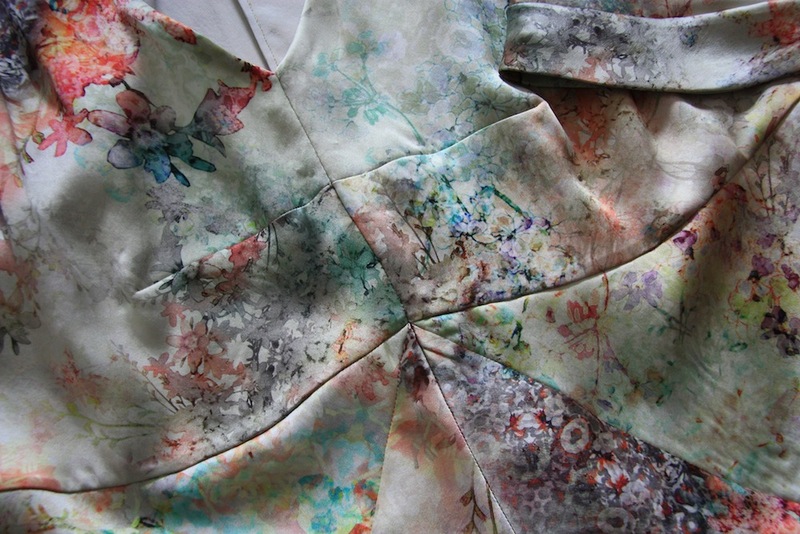 Plus I’m nearing completion of that Marfy Jacket I showed you the muslin of – and I’m loving it to bits. Then I’m really going to have to get stuck into some maternity sewing! 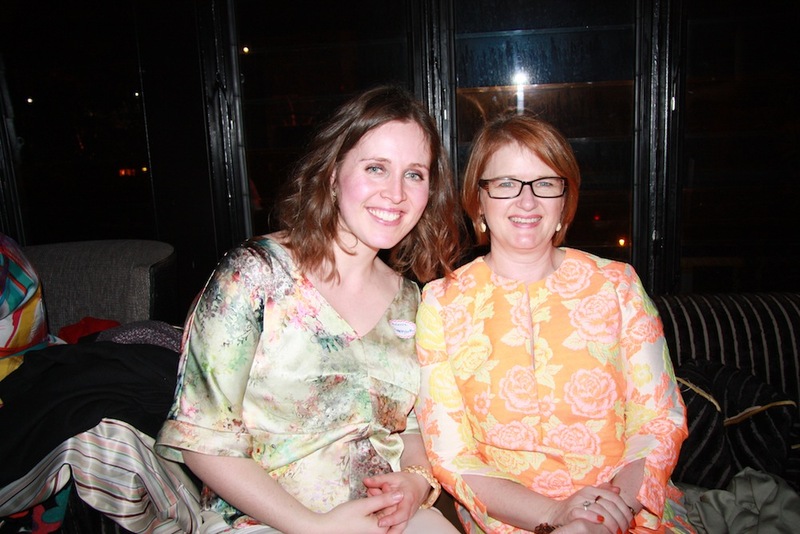 I’ll leave you with some (sadly, rather over-exposed) photos from Frocktails – so much self-sewn fabulousness! 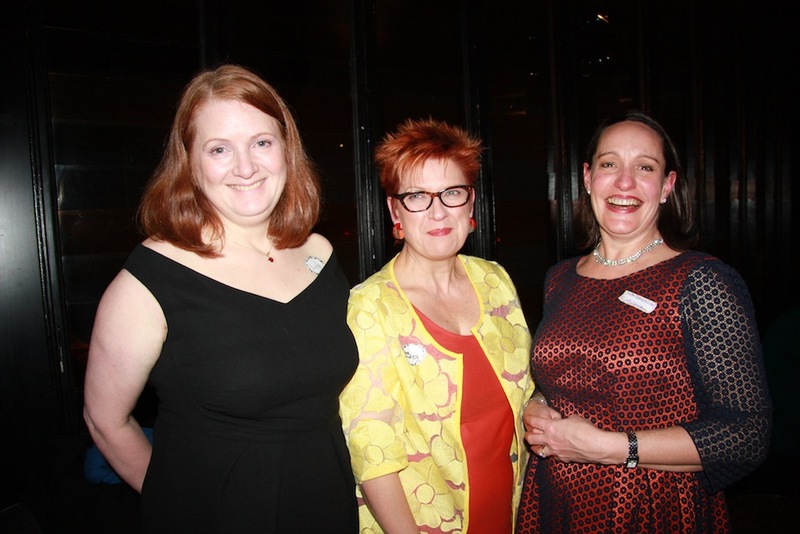 51 ladies from Australia’s east coast AND New Zealand joined in the fun – we had a private function space at Collins Quarter and a signature cocktail which was named the ‘Seam Ripper’ (Gin based, of course. I was devastated to not be able to partake!). It was an amazing night and I’m already looking forward to the next one! Congratulations on your pregnancy… how exciting.Ooh what fun! 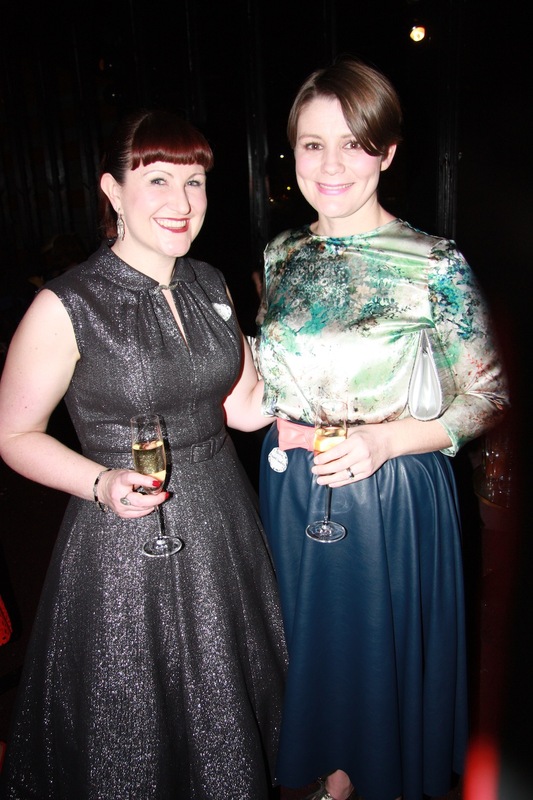 51 is a huge number… Lots of lovely outfits there! It certainly was – I don’t think I got the chance to chat to (and get a close up of all the sewing skills on display) even half the sewists there! Wow, congratulations!! I hope you are feeling well and enjoy the next few months of your pregnancy. You always choose such beautiful fabrics. I have this pattern but have not made it up, due to all the work required in other people’s versions…but you have totally pulled this off! Frocktails sounds so much fun. 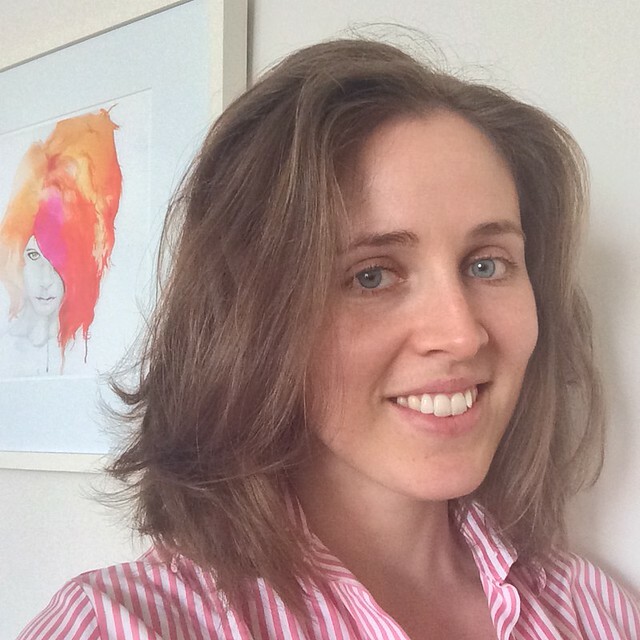 Thanks Katherine – I’ve certainly sailed through everything so far, with nothing other than fatigue really. I think that makes me fairly lucky! Your fabric is divine and beautifully showcased with this pattern! Perfect seam matching of course, but I would expect no less from you! I have made this top 3 times now with a fourth in the pipeline. I get lots of wear from mine, much more than if I had made a silk dress, so I hope you will find the same. 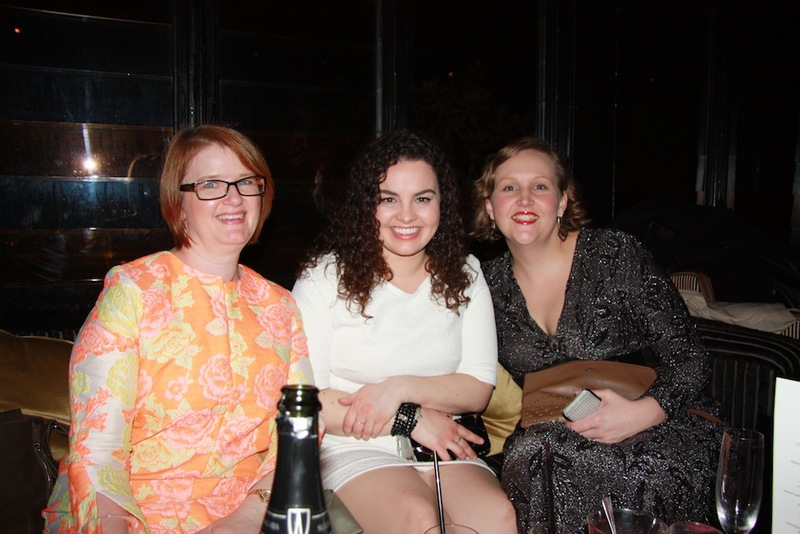 Oh wow, Thanks Mel for the gorgeous photos, it was such a fun night!!! I love, love, love your top, and how perfectly gorgeous it is on the inside too (even with the rebellious overlocker seam). You are radiant, and it was wonderful to see you last night. Lovely top and congratulations. It looked like a fun time with the ladies. What an exciting time; new house and baby on the way! 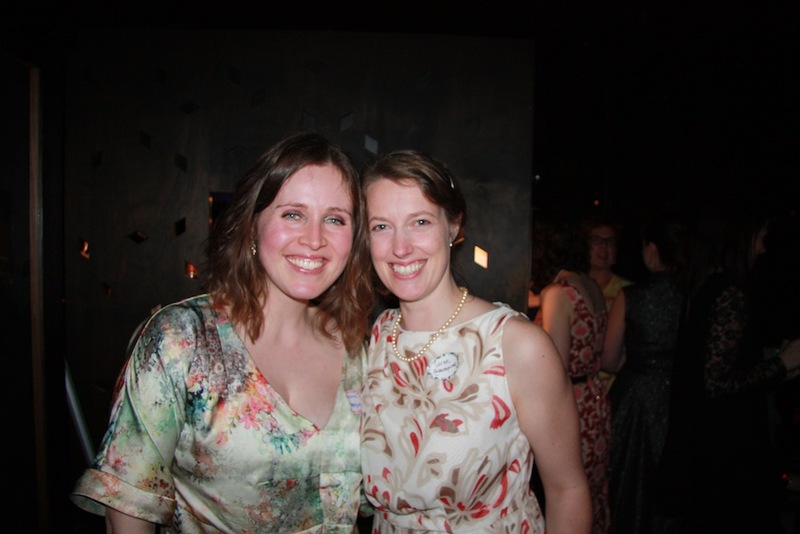 Thanks Mary – it was an excellent night, and totally worth spending all of Sunday yawning! Congratulations and your top is lovely, such a luscious silk. 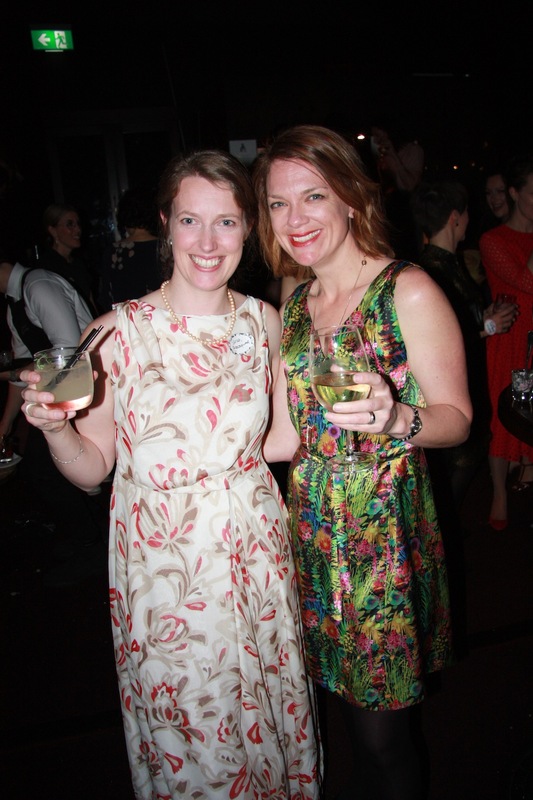 Great to see all the frocktails photos, would have loved to have been there. What a beautiful top! I love it and hope you successfully make one one day. 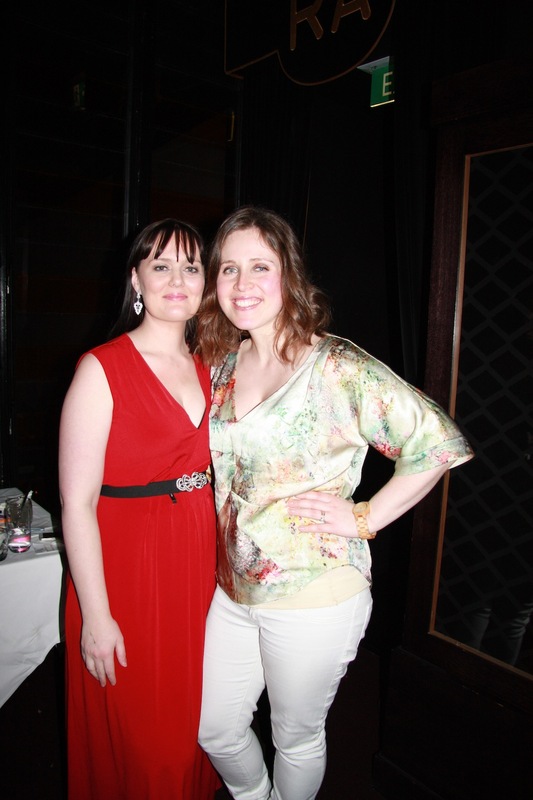 So lovely to see you- you look fabulous!!! Your top was so delicate looking. Congratulations on glowing all night Melanie. What a beautiful top! I always feel slightly wrong using my favorite fabrics for a blouse instead of a dress, but I never regret it. Best wishes for a healthy, uneventful pregnancy! I don’t think there will ever be regret when it comes to using up this fabric for this top. I really do love the pattern, and hope to be reaching for it regularly until it fits me no more! The intersecting seams that were almost perfect on my Rachel Covey blouse are not perfect enough so they are being sewn again. Does a walking foot make a big difference when matching seams like this? Not necessarily a walking foot (although that might help), but I find that pinning that intersection in place, then sewing with a basting stitch for a cm or two either side of the point, before turning it over and checking – gives the best result. That way you can easily pull out the basting stitch if it’s not quite right, and do it again. When you come to sew the full seam, you know that little section is sorted and secured! Wow you southern hemisphere sewists really do it up right! what a great get together and fun to see so many familiar faces. Congrats on your news and yes make some fabulous maternity garments, looking forward to seeing them. Thanks Beth! I’m looking forward to maternity sewing actually – I haven’t really worked with stretch much before, so it will be a lovely challenge! 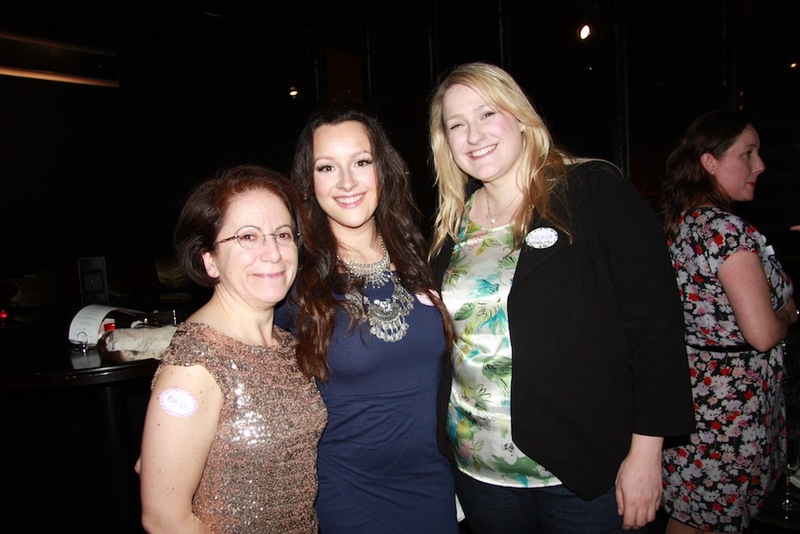 Frocktails was an amazing event – I believe that was the third, and it just keeps getting bigger. The only sad part is I didn’t quite get the chance to chat to everyone! Love it! The top is super pretty, and your fabric selection is gorgeous. 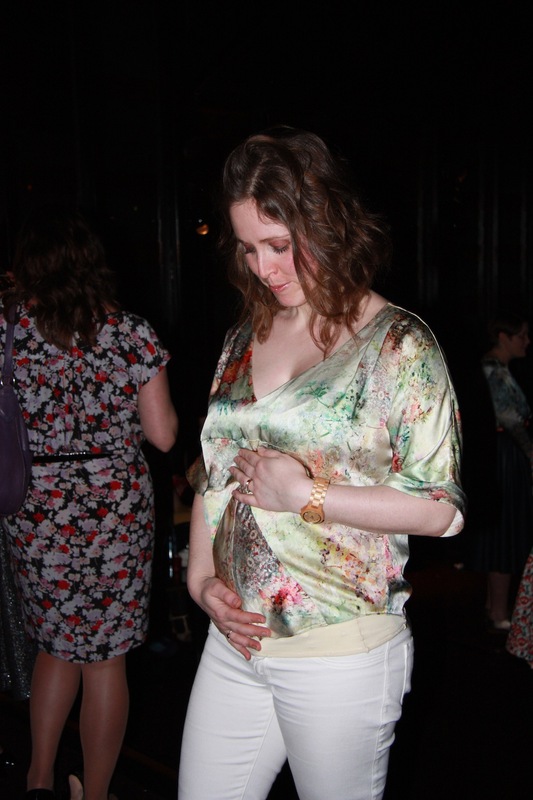 Gorgeous top and gorgeous bump! Beautiful top! It looked great with your white jeans. 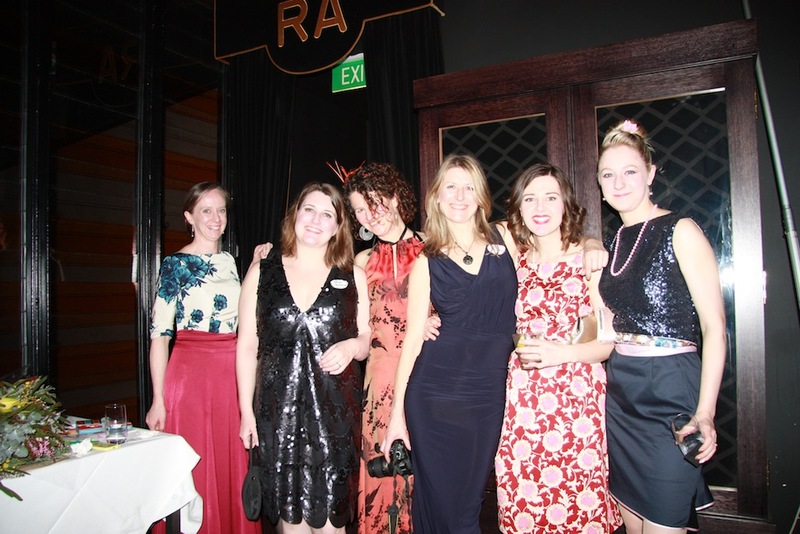 Frocktails was so fun – looking forward to next year already! I’m actually thinking of heading out to the Cloth Shop so I can score some in the colour way you have, I like this fabric that much!! 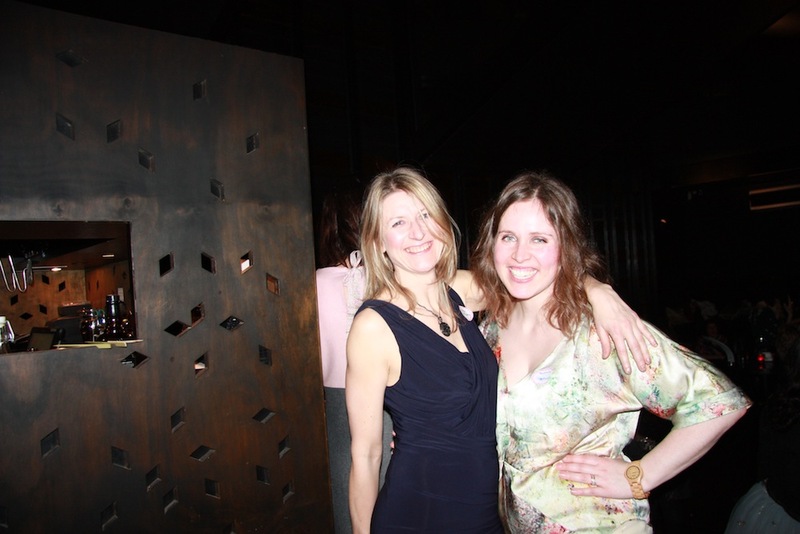 Thanks Rachel – was so lovely to see you again :) Until next time! A very super congratulations to you! I love your fabric choice for this top and cannot believe you underlined the entire thing! That interior pic is amazing. Thank you, Tia! I’m still very much taken with your black and white striped version of Vogue 1282! Congratulations, and your top looks gorgeous, underlined as well, perfect. Such an awesome night, and it was brilliant to see you again lovely! Likewise! And I want to see you in Vogue 8900! Gorgeous! And congratulations! You are most definitely glowing!! Thanks Liza! It seems like only just yesterday baby Jane came into the world – it all happens so fast! Congratulations on the bump. Frocktails sounds like it was a great night and your top is beautiful – there were clearly many gorgeous sewn items in the room that night. Thanks Robyn! It certainly was a veritable bevy of beautifully sewing garments! Your top is lovely, it looks luxurious and I’m sure it feels the same. And you look great! How tall are you, maybe you’re not showing that much because baby’s taking up space vertically? Thanks Geo! And that would be my guess too – I’m 1.68m but I’m really long through the waist – so there is plenty of space to hide I suppose! Congratulations on your pregnancy!! Not sure how I didn’t notice that but I guess we were sitting down? How exciting. 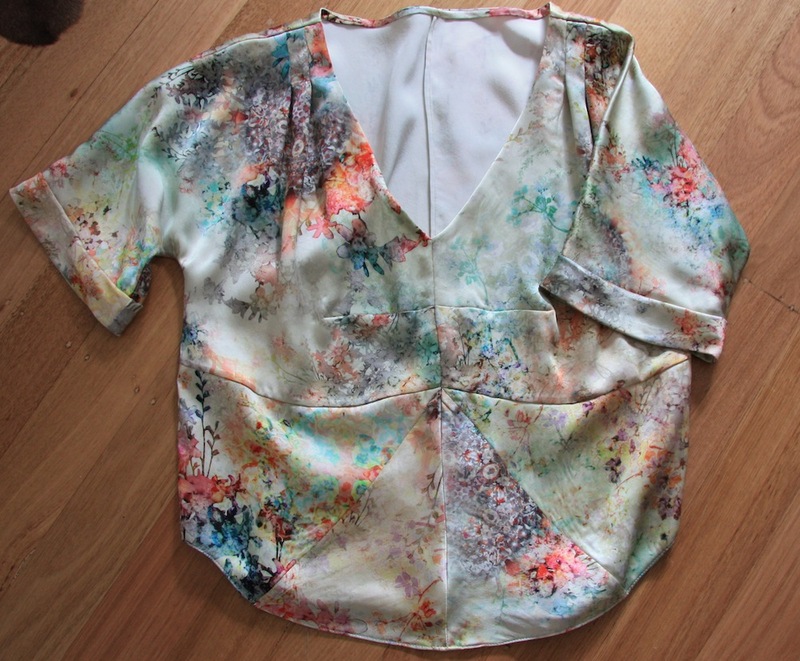 I absolutely loved the fabric you used for your top and your underlining deets are very interesting to read about. What a rare treat to get to hang out with sew many sewists. Awh, Congratulations! What a beautiful make for a beautiful time in your life. You look lovely! I am full of emotions! Congrats and big hug! Cheers Inna! Here’s to big life changes!! Cheers, Melanie! What a fun-looking event. Your blouse turned out beautifully! I think the CDC underlining was a good idea. I’ve made two of these in cotton voile and I often wish they had a little more oomph. Thanks Morgan! I was worried it would take away from the floatiness of the top – but it definitely doesn’t. In fact, I think it makes for a better bias seam connection at the front – so many of the tops I’ve seen of these are noticeably saggy in the seams in this area. Cotton voile underlined in CDC? Oh, I can definitely see how the little bit of extra weight would add so much! Thanks Helen – you definitely need to make this one, it’s pretty darn fabulous!! You definitely look way too good to be pregnant!! ;) you and your top look divine. Sorry I didn’t get a chance to have a good chat with you on Saturday; I was on borrowed time and had to leave early. Looking forward to following along with all your maternity makes! Is this the point where I say something lame like ‘It’s what’s on the inside that counts?’ haha! I’m sorry I missed you too – I know you’ve got a lot on at the moment with your boys – it was so lovely to see you there! Many many congratulations on your pregnancy! May it go smoothly and without undue excitement! Thanks Shams – I’m hoping so too! That would be lovely, Jenny! I’m really enjoying being back at social sewing after missing it for 6 odd months. 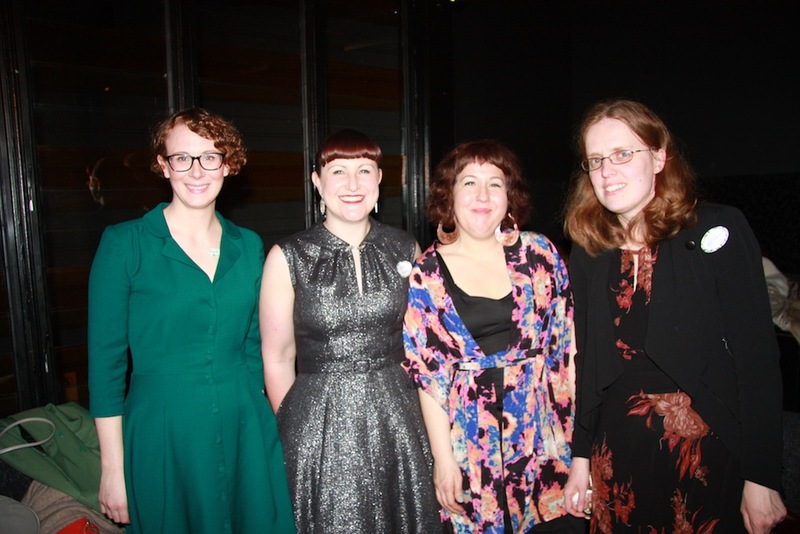 I don’t think I even got around to talking to 50% of the frocktails attendants – and that was even with hardly any time spent introverting on the couch at the back! The intersection of seams looks way more complex than it actually is ;) But thank you! 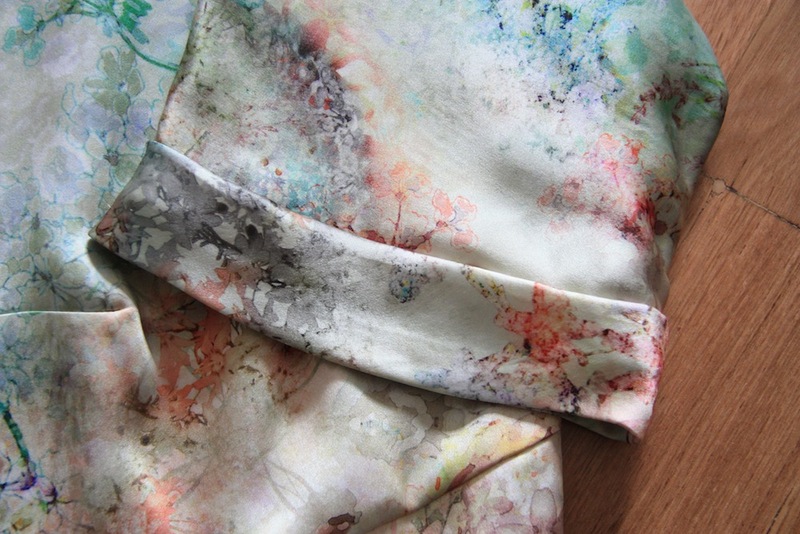 Firstly – I love the fabric for your Rachel Coomey top. 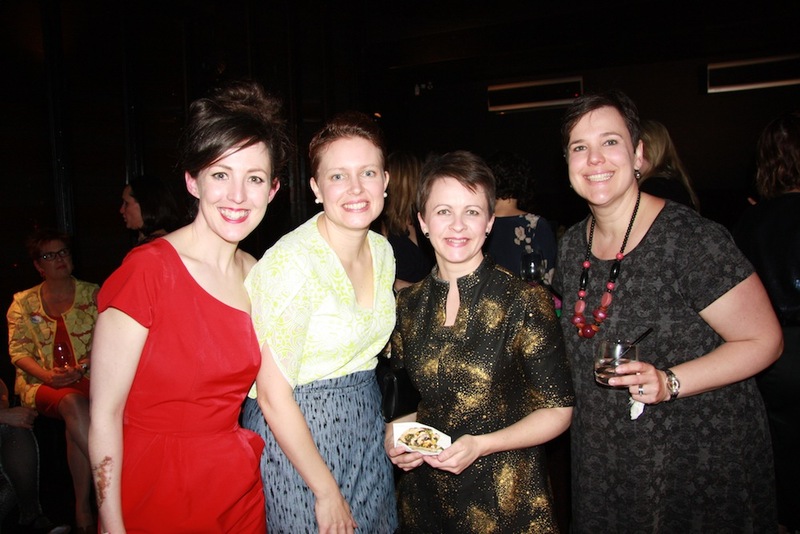 Second, I’m Sydney based and would love to come to the next Frocktails event! 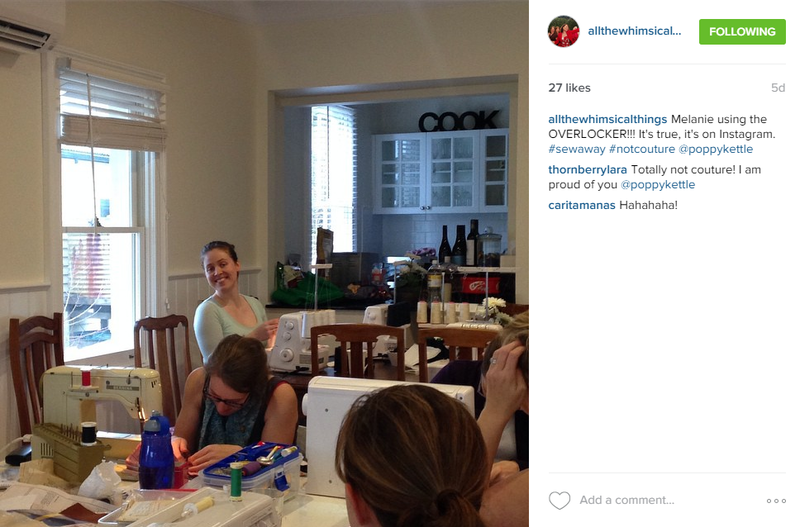 The only thing better than talking about sewing with other sewists is probably sewing itself! Definitely the highlight in my social calender – you won’t regret it. Plus, it would be lovely to meet you! 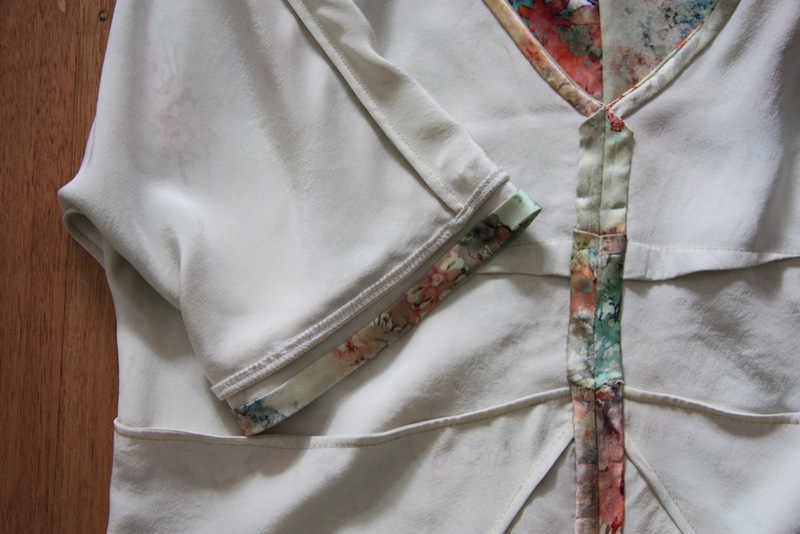 The blouse is beautiful, both inside and out! 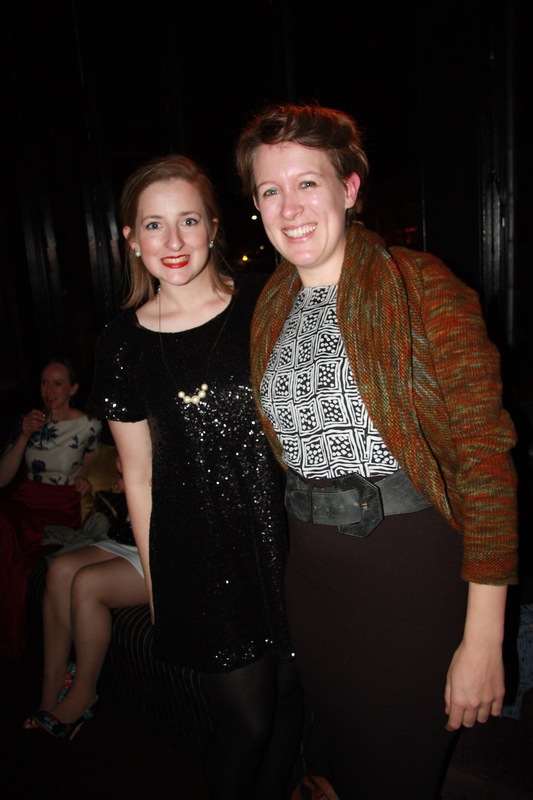 I also love the fun photos from Frocktails! Congratulations on your pregnancy :-) What a great idea to interline a silk charmuese with a crepe de chine, I would have been too scared that they would move on top of one another and I would get puckering in all the wrong places. Your top looks fabulous and I bet it feels soo good to wear. More tops like that would be perfect for pregnant body, especially as summer approaches. This is so beautiful! I love the silk you used! I’ve had this pattern for years but I’ve yet to try it… to be honest, it terrifies me for some reason! Yours really looks lovely! And wow, 51 sewists in one place?! Amazing!